Big Finish: Doctor Who - THE WAR DOCTOR: ONLY THE MONSTROUS Review | Warped Factor - Words in the Key of Geek. Matthew Kresal checks out the new War Doctor box set from Big Finish. When one looks back over 2015, it comes across as one of Big Finish's banner years. Sixteen years into producing audio dramas based on Doctor Who, the company shows no sign of slowing down. They released their 200th story in the monthly range that began in 1999, began a new series of audio adventures for the Third Doctor and saw Colin Baker's Sixth Doctor regenerate at last. Perhaps, above all, the announcement that the company could at last enter into the previously forbidden realms of the New Series was the cause for biggest anticipation. 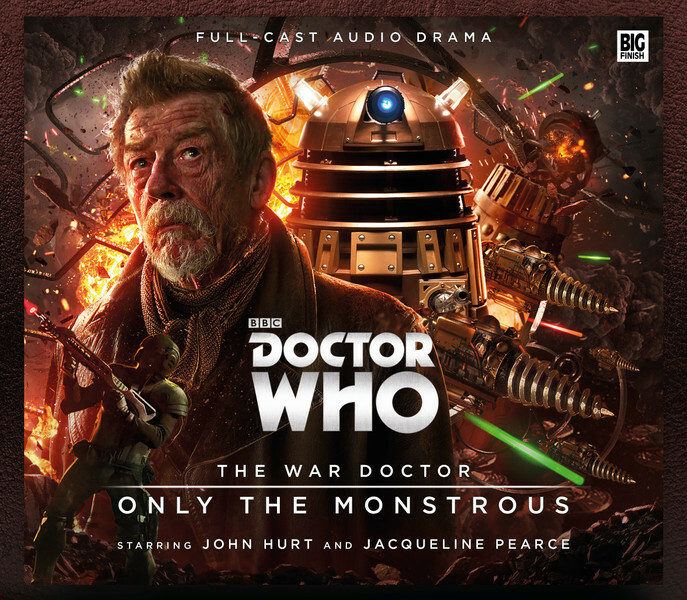 The end of 2015 saw the release of the first New Series related stories including one that promised to take listeners into the much speculated but largely unseen Time War and the Doctor who fought it in the form of the man who renounced that name played by John Hurt. Entitled Only The Monstrous, this three disc release (four counting a bonus features disc) promised great things, but did it live up to them? On the surface, Only The Monstrous promised two things. The first of which was the return of John Hurt's War Doctor who had only appeared onscreen back in 2013. Listening to the opening minutes of the set, you'd never know Hurt had ever been away. Having appeared fully formed and afire in The Day Of The Doctor, this takes place some time before that with a Doctor who willingly tries to sacrifice himself in its opening moments. This is a War Doctor who has fought the Time War for a long time though he isn't quite the man we meet in the midst of the fall of Arcadia. Hurt plays this darker, more mournful man excellently, and his best moments are when he at his darkest. The scripts from Nicholas Briggs do offer him some lighter moments, especially here in the opening disc, which Hurt plays admirably and there are echoes of the Doctor we're more used to there. At its heart though, this is a war story and Hurt plays the bitter warrior who is sick of fighting but knows there is no other way beautifully. It's Hurt's performance that makes this release a must listen for fans. The second thing it promised was a major look into the Time War. Between Day Of The Doctor and the 2014 novel Engines Of War (as well as the unofficial for charity anthology Seasons Of War), we've had very few glimpses into the conflict that has played a major role in shaping the back story of the 21st incarnation of Doctor Who on television. Only The Monstrous promised to change that by offering a view into the Time War itself. It's a promise that is delivered upon but perhaps in not quite the satisfactory manor that fans were expecting. What it deliver is a look at the Time War from both the front lines and, to some extent, from the sidelines. We're introduced to Cardinal Ollistra (played by Blake's 7 Jacqueline Pearce) and a number of agents of hers, including Veklin (played by Big Finish stalwart Beth Chalmers), who initially deal with the aftermath of the box-set's opening minutes before embarking on a larger convert mission in which the War Doctor is drawn in. Briggs paints an interesting picture of Time Lord society at war, one that draws upon and expands on what we've been presented to date while also adding a new portion to the Time War story which comes to the fore in the back half of the release. All of which, it must be said, is immensely satisfying. What isn't so satisfying is what the story really boils down to. Following the opening disc, which acts as an interlude of sorts before the main story kicks in, we find the War Doctor recuperating on Keska with the help of a nursemaid (played by Lucy Briggs-Owen). This story takes the listener and War Doctor alike into what appears to be a Dalek stratagem., and it's this part of the story which is perhaps a tad underwhelming due to it being slightly overly familiar as Briggs script draws inspiration not just on past televised Dalek stories (including The Dalek Invasion Of Earth) but his own previous Big Finish series Dalek Empire. For those expecting a full-on Time War story, you might just be in for a bit of a disappointment as this is perhaps more akin to traditional Dalek stories. If you don't mind that, and perhaps if you can accept that, then Briggs presents a tale of a very different kind of Doctor in a rather traditional story which gives the box-set a boost, as well as something that helps to separate it from much of Big Finish's other output. However, there is plenty more to find to enjoy in Only The Monstrous. Pearce's Ollistra is a delight to listen to, with the right mix of seriousness and wit while also not echoing too much of Pearce's more famous role from Blake's 7. The War Doctor's pseudo-companions, Briggs-Owens Nursemaid and Carolyn Seymour's Slave, are both interesting and give good performances as they bounce off Hurt and react to his almost vicious temper at times while also bringing out the best in him. The rest of the supporting cast features a large number of Big Finish stalwarts, including the aforementioned Chalmers, Barnaby Edwards, John Banks and Mark McDonnell, who all help to populate the world of the Time War. Rounding off the cast is Nicholas Briggs, who is, of course, playing the Daleks and brings the usual amount of menace and anger to his readings. Only The Monstrous has a solid cast both in Hurt and its supporting players. Last but not definitely not least is the music and sound design of Howard Carter. From the new version of the show's signature theme to the score of some of the biggest moments, Carter's work is nothing short of cinematic. Listening to the music suite at the end of the third disc, it's hard not to hear echoes of John Debney's score for the 1996 TV Movie at times, something which helps this to act as the bridge between the different TV incarnations of the series. Carter's sound design is just as impressive as it takes in Gallifrey, Keska, and a Dalek slave labor facility along the way. The results are nothing short of impressive.